PRIVACY STATEMENT. We are committed to protecting your privacy. Authorized employees within the company on a need to know basis only use any information collected from individual clients. We constantly review our systems and data to ensure the best possible service to our clients. Congress has created specific offences for unauthorized actions against computer systems and data. We will investigate any such actions with a view to prosecuting and/or taking civil proceedings to recover damages against those responsible. CONFIDENTIALITY. Our policies concerning the use of your personal information are set forth in the Internet Privacy Statement at https://tekeaseonsite.com and incorporated by reference herein. By using this Site or the services provided by or through this Site, you agree to waive and release TEKEASE ON-SITEs from any claim or liability in connection with the collection, use, or disclosure of information consistent with the Internet Privacy Statement. LINKS TO OTHER WEB SITES. 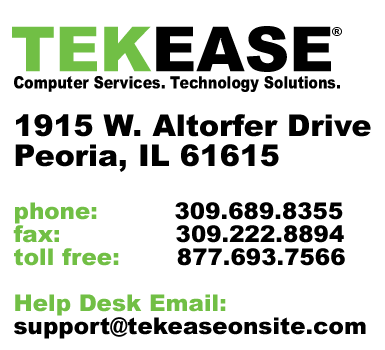 TEKEASE ON-SITE may provide links on this Site to other Web sites that are not maintained by or under the control of TEKEASE ON-SITE solely as a convenience to you. If you use these links, you will leave this Site. Please remember that linked sites are not TEKEASE ON-SITE’ sites and the information could change without TEKEASE ON-SITE’ knowledge. Linked sites and their contents should not be attributed to TEKEASE ON-SITE in any manner. TEKEASE ON-SITE has not attempted to verify the truth or accuracy of any third party site or content and does not make any representations or warranties about them. If you decide to access any of the third party sites linked to this Site, you do so entirely at your own risk. In the event TEKEASE ON-SITE endorses a particular organization, we will clearly state our endorsement next to any link to that organization. PAYMENT Cash or Personal Check with Bank Card, all major Credit/Debit Cards and Bank Drafts are all acceptable methods of payment. Returned checks will incur a $75 charge to cover banking fees and administrative costs. In an instance of a second Returned Check, we reserve the right to terminate the arrangement and, if agreed to, we shall insist on future cash transactions only. Consequently, all transactions and agreements entered into will cease with immediate effect until such time as any and all outstanding monies are recovered in full. SUBMISSIONS. While TEKEASE ON-SITE is pleased to hear from users and welcomes your comments regarding TEKEASE ON-SITE’ programs and services, TEKEASE ON-SITE’ policies do not allow it to accept or to consider creative ideas, suggestions, or materials other than those it has specifically requested. The intent of this policy is to avoid the possibility of future misunderstandings when projects developed by TEKEASE ON-SITE’ employees and agents might seem to be similar to creative works submitted by users. Accordingly, while TEKEASE ON-SITE values your feedback; TEKEASE ON-SITE must ask that you do not send original creative materials except when specifically requested to do so. Whether you send submissions in response to contests or whether you send creative suggestions, ideas, notes or concepts or other materials, if you send specific submissions without a request from TEKEASE ON-SITE (collectively, “Comments”), ANY COMMENTS YOU SEND TO US BY ANY MEANS SHALL BE DEEMED TO BE NON-CONFIDENTIAL, NONPROPRIETARY AND WE SHALL HAVE NO OBLIGATION OF ANY KIND WITH RESPECT TO SUCH INFORMATION AND SHALL BE FREE TO REPRODUCE, USE, DISCLOSE, AND DISTRIBUTE THE INFORMATION TO OTHERS WITHOUT LIMITATION. We shall be free to use any ideas, concepts, materials, intellectual property, know-how or techniques contained in the comments for any purpose whatsoever including but not limited to developing, manufacturing and marketing of products incorporating such information. IF YOU HAVE ANY PROTECTIBLE RIGHTS IN THE COMMENTS, YOU HEREBY GRANT DR. KNOW SYSTEMS, LLC A ROYALTY FREE, IRREVOCABLE, AND WORLDWIDE LICENSE, IN PERPETUITY TO USE THE COMMENTS. IF WE DO USE THE COMMENTS YOU SHALL NOT BE ENTITLED TO ANY CREDIT, CONSIDERATION, NOTICE OR PAYMENTS OF ANY KIND. YOU WAIVE ANY MORAL RIGHTS YOU HAVE TO THE COMMENTS. COPYRIGHTS OR OTHER INTELLECTUAL PROPERTY RIGHTS WHICH MAY RESULT FROM THE USE OF THE COMMENTS SHALL BETHE SOLE PROPERTY OF DR. KNOW SYSTEMS, LLC. IF ANY USE BY DR. KNOW SYSTEMS, LLC OF THE COMMENTS CAUSES THEM TO BE LIABLE TO ANY THIRD PARTY YOU AGREE TO INDEMNIFY DR. KNOW SYSTEMS, LLC FOR ANY AND ALL DAMAGES, COSTS, JUDGMENTS AND EXPENSES (INCLUDING REASONABLE ATTORNEY FEES) WHICH DR. KNOW SYSTEMS, LLC INCUR AS A RESULT OF THE USE OF THE COMMENTS. DISCLAIMER OF WARRANTIES. THIS SITE, INCLUDING ANY INFORMATION, PRODUCTS, SERVICES, OR MATERIAL MADE AVAILABLE ON OR THROUGH THIS SITE, ARE PROVIDED ON AN “AS IS” AND “AS AVAILABLE” BASIS. TO THE MAXIMUM EXTENT PERMITTED BY LAW, DR. KNOW SYSTEMS, LLC EXPRESSLY DISCLAIM ALL WARRANTIES OF ANY KIND, EXPRESS OR IMPLIED, INCLUDING WITHOUT LIMITATION ANY WARRANTY OF MERCHANTABILITY, FITNESS FOR A PARTICULAR PURPOSE OR NON-INFRINGEMENT. FURTHERMORE, DR. KNOW SYSTEMS, LLC DOES NOT WARRANT THE ACCURACY OR COMPLETENESS OF ANY INFORMATION AT THIS SITE AND DR. KNOW SYSTEMS, LLC MAY MAKE CHANGES TO THE INFORMATION AT THIS SITE, INCLUDING TO THE PRODUCTS, SERVICES, OR PRICES DESCRIBED AT THIS SITE, AT ANY TIME WITHOUT PRIOR NOTICE TO USERS OF THIS SITE. INFORMATION AT THIS SITE THAT IS PERIODICALLY UPDATED MAY NOT BE CURRENT AT THE MOMENT YOU VISIT THIS SITE AND MAY CONTAIN ERRORS. DR. KNOW SYSTEMS, LLC MAKES NO WARRANTY THAT THE SITE WILL MEET YOUR REQUIREMENTS; THAT THE SITE WILL BE UNINTERRUPTED, TIMELY, SECURE, OR ERROR FREE; THAT MESSAGES OR REQUESTS WILL BE DELIVERED; THAT DEFECTS WILL BE CORRECTED; OR THAT THIS SITE IS FREE OF VIRUSES OR OTHER HARMFUL COMPONENTS. DR. KNOW SYSTEMS, LLC MAKES NO WARRANTY REGARDING ANY GOODS OR SERVICES PURCHASED OR OBTAINED THROUGH THE SITE OR ANY TRANSACTIONS ENTERED INTO THROUGH THE SITE. YOU ASSUME THE ENTIRE RISK AS TO THE RESULTS AND PERFORMANCE OF THE SITE AND ANY GOODS OR SERVICES PURCHASED THEREFROM. IN NO EVENT WILL DR. KNOW SYSTEMS, LLC BE LIABLE FOR ANY DAMAGES WHATSOEVER, INCLUDING BUT NOT LIMITED TO DIRECT, INDIRECT, INCIDENTAL, PUNITIVE, AND CONSEQUENTIAL DAMAGES (INCLUDING WITHOUT LIMITATION THOSE RESULTING FROM LOST PROFITS, LOST DATA OR BUSINESS INTERRUPTION) ARISING OUT OF THE USE, INABILITY TO USE, OR THE RESULTS OF USE OF THIS SITE, ANY WEB SITES LINKED TO THIS SITE, THE MATERIALS OR INFORMATION CONTAINED AT ANY OR ALL SUCH SITES, OR THE MATERIALS, PRODUCTS OR SERVICES OFFERED ON THIS SITE OR SITES LINKED TO THIS SITE, WHETHER BASED ON WARRANTY, CONTRACT, TORT OR ANY OTHER LEGAL THEORY AND WHETHER OR NOT ADVISED OF THE POSSIBILITY OF SUCH DAMAGES. IN NO EVENT WILL DR. KNOW SYSTEMS, LLC, DR. KNOW SYSTEMS, LLC’ SUPPLIERS, OR ANY OTHER PARTY INVOLVED IN CREATING, PRODUCING, OR DELIVERING THIS SITE BE LIABLE TO YOU IN ANY MANNER WHATSOEVER FOR ANY DESIGN MADE OR ACTION OR NON-ACTION TAKEN BY YOU IN RELIANCE UPON INFORMATION PROVIDED THROUGH THIS SITE. SOME STATES DO NOT ALLOW THE EXCLUSION OR LIMITATION OF INCIDENTAL OR CONSEQUENTIAL DAMAGES SO THE ABOVE LIMITATION OR EXCLUSION MAY NOT APPLY TO YOU. TRADEMARK INFORMATION. TEKEASE, LIFE-SUPPORT FOR YOUR TECHNOLOGY™ and DR. KNOW SYSTEMS, LLC™ and any other marks associated with TEKEASE ON-SITE are the sole property of TEKEASE ON-SITE No license to use any of these marks is given or implied. These marks may not be copied, downloaded, reproduced, used, modified, or distributed in any way (except as an integral part of an authorized copy of material appearing in these Web pages) without prior written permission of TEKEASE ON-SITE ©2009-2014 TEKEASE ON-SITE and TEKEASE. All Rights Reserved. THIS SITE IS INTENDED FOR U.S. AUDIENCES ONLY. Access to and use of this web site is subject to the terms and conditions above. This web site was developed and is maintained by the TEKEASE ON-SITE, P.O. Box 3501, Peoria, IL 61612. Unless otherwise specifically indicated, sweepstakes and other promotional offers are open to United States residents only. COPYRIGHT ACT AGENT. TEKEASE ON-SITE respects the intellectual property rights of others, and requires that the people who use the Site do the same. If you believe that your work has been copied in a way that constitutes copyright infringement, please forward the following information to the Copyright Agent named below: Your address, telephone number, and email address; A description of the copyrighted work that you claim has been infringed; A description of where the alleged infringing material is located; A statement by you that you have a good faith belief that the disputed use is not authorized by you, the copyright owner, its agent, or the law; An electronic or physical signature of the person authorized to act on behalf of the owner of the copyright interest; and a statement by you, made under penalty of perjury, that the above information in your Notice is accurate and that you are the copyright owner or authorized to act on the copyright owner’s behalf.